I am Boggled beyond all imagination where we are today as a country. For the first time in my life I am voting against EVERY incumbent Republican that is up for re-election. The Constitution is MORE than just a piece of paper. I hope you do the same. On Tuesday, when this page runs the list of people it has endorsed for election, we will include no Republican Congressional candidates for the first time in our memory. Although Times editorials tend to agree with Democrats on national policy, we have proudly and consistently endorsed a long line of moderate Republicans, particularly for the House. Our only political loyalty is to making the two-party system as vital and responsible as possible. That is why things are different this year. He has plundered our seas, ravaged our Coasts, burnt our towns, and destroyed the lives of our people. He is at this time transporting large Armies of foreign Mercenaries to compleat the works of death, desolation and tyranny, already begun with circumstances of Cruelty & perfidy scarcely paralleled in the most barbarous ages, and totally unworthy the Head of a civilized nation. He has constrained our fellow Citizens taken Captive on the high Seas to bear Arms against their Country, to become the executioners of their friends and Brethren, or to fall themselves by their Hands. He has excited domestic insurrections amongst us, and has endeavoured to bring on the inhabitants of our frontiers, the merciless Indian Savages, whose known rule of warfare, is an undistinguished destruction of all ages, sexes and conditions. This EXCITES me. It would be spectacular to take 20 Thousand plus pictures, Tag them AND make them searchable in a matter of hours. These guys are going to make millions. …The process starts with registration and choosing a privacy setting on your pictures. You then download a client application that uploads photos you choose to include in Riya. The actual uploading takes a while – about 4 hours for each GB of photos. Instead of waiting around, Riya will email you when the process is complete. That’s when the fun starts. In my case about 400 pictures were uploaded. I was presented with a view of facial thumbnails of everyone in my photos. Riya asks that you begin to educate it by telling it who the people are…it then very quickly starts to auto-tag pictures with a surprising level of accuracy. Within moments I had a large percentage of my photos fully tagged with people’s names. Riya also recognizes text in photos, and lets you select any area of a photo and tag that as well. For instance, you could select just the Eiffel Tower in a photo and tag it as such. Within moments, everything of importance in all of my photos was tagged. And more importantly, it was searchable. Thanks to TechCrunch for sharing! 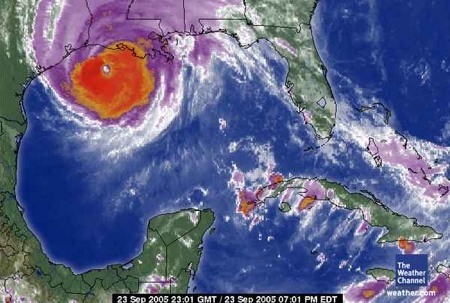 There are some great animated images over at weather.com of Hurricane Rita. Recent updates are that she is losing strength and will make landfall tonight as a Category 3 storm, but just barely. Check out Hurricane Central for the most current conditions and updates. NOAA Portrait of Hurricane Rita. 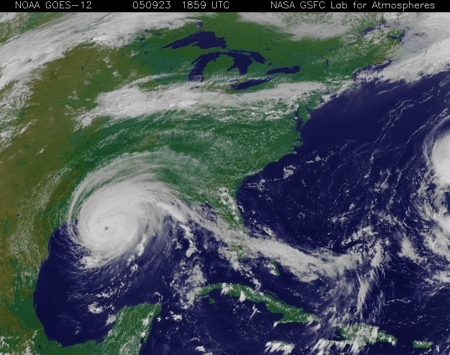 More information available from NOAA. Take a minute to honor the people, who gave their lives, in the unknown war of terror. Where were you and what were you doing that fateful morning? Interesting essay, especially when you look at the failure of authority in New Orleans. Luke Mitchell of Harpers says: “We have excerpts from a great essay by Rebecca Solnit up at Harper’s right now, about how authorities deal with disaster, and I am hoping I can get it as well distributed as humanly possible, because it might help to build a counter-narrative to the story that is being constructed this very minute about what is going on in New Orleans. Rebecca’s argument is that disaster always calls authority into question, and when authority is in question, the powers that be will often attempt to create a narrative of human behavior that calls for (surprise) even greater authority.